The current Rüsselsheim flagship in the tunnel: The Insignia is covered in reflective lines. 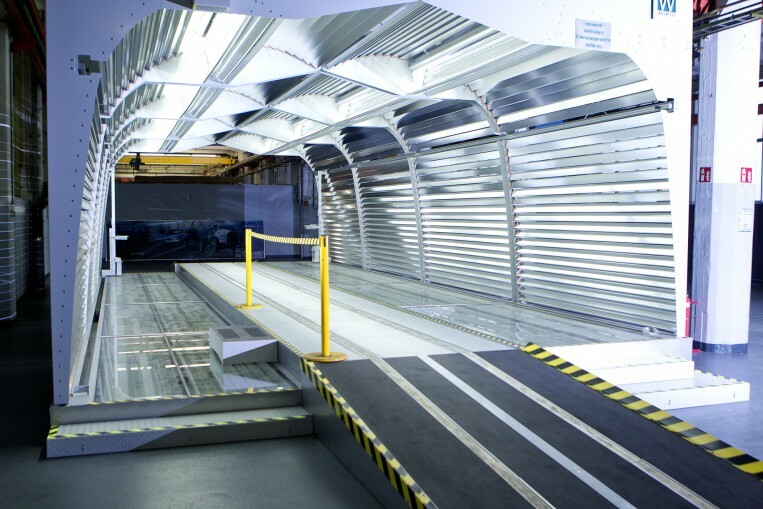 In Rüsselsheim, the prototypes of the future will be tested in a light tunnel. We’re taking a closer look at what this means. 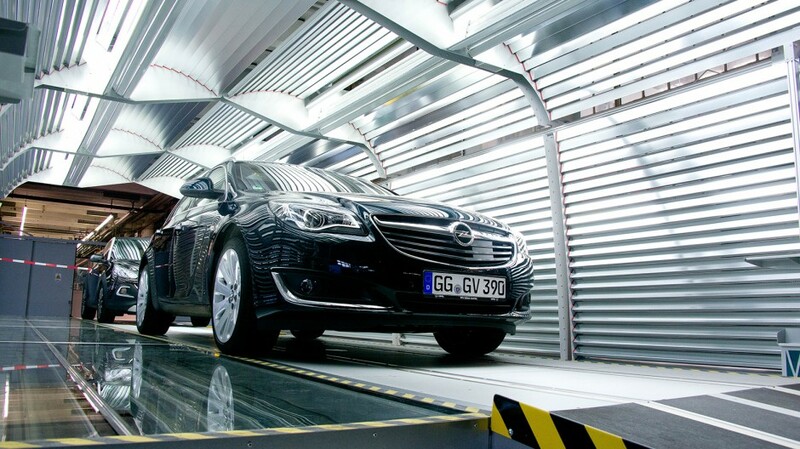 Rüsselsheimer Flaggschiff im Tunnel: Auf dem Opel Insignia bilden sich deutliche Reflexionslinien. 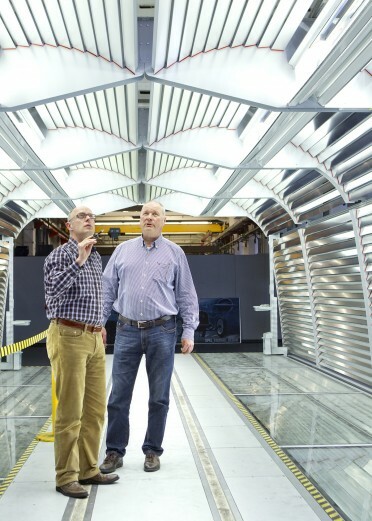 On 14 April 2015, GM Executive Vice President & President Europe Karl-Thomas Neumann was joined by Executive Director Manufacturing Engineering Anja Kleyboldt and Vice President GM Europe Quality Thomas Simon to formally open the new light tunnel. “The tunnel will contribute greatly to the quality development of our future models,” says Gregor Ruf, Manager of Forming Simulation. Together with Team Leader Toni Becker and project members Andrea Lüllig, Klaus Borngässer, Detlev Lorenz, and Stefan Beck, Ruf was proud to present the Adam Opel AG management team with the fruits of their labor. This article outlines the key points of the project. For development projects, the fluorescent lamps that were previously used for assessing surface qualities are finally being replaced. Nothing escapes the discerning gaze of Toni Becker and Gregor Ruf. 1. How does the light tunnel work? 2. What area will the tunnel be deployed in? Initially, the light tunnel will only be used for development projects. This made it difficult to find a suitable location for it – one that was both expansive but also concealed. “When we have new prototypes entering the tunnel, we need to be able to guarantee complete secrecy,” says Becker. As a result, half of the investment budget was allocated to refitting the premises and the other half to the tunnel itself. 3. How are the vehicles examined in the light tunnel? 4. How were surfaces assessed previously? Until now, the quality of the lacquered chassis could only be assessed using a wall of fluorescent lamps. Unfortunately, some of the vehicle’s surfaces could not be tested properly or at all using this method. Also, the working conditions created by the fluorescent lamps were very unpleasant over extended periods of time. The fluorescent tubes would get hot and heat up the room too much, and the glaring quality of the light would cause eye strain. In addition to that, the fluorescent lamps were also very expensive to run. “With the new light tunnel, we save 50 percent of our power costs, and our air conditioning is also 30-40 percent less expensive to run,” says Toni Becker. 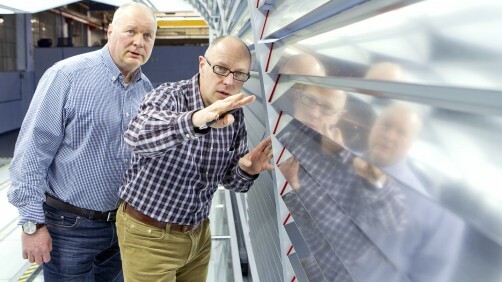 Initially, the new light tunnel in Rüsselsheim will only be used to illuminate development projects.